Whimbrel Nature: Chase The Light! Yesterday I relearned a lesson about chasing the light. 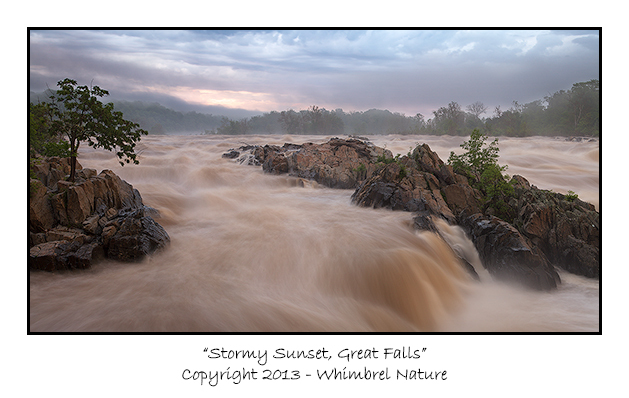 The all day thunderstorms and rain showers seemed to let up and I thought about taking a quick trip to Great Falls National Park for sunset. I was almost ready to go and the sky started to really cloud up again (despite what the radar/satellite imagery was saying). It looked like it was threatening to rain or possibly thunderstorm again. I almost called it, and stayed home, but I was hoping that the sun would get under the clouds as it set in the west and illuminate them from below in a spectacular display just before dark. It was very likely that I was going to end up with boring overcast skies and not much of a sunset (I've been skunked before on days like this). Well, I didn't get the conditions I expected. The sun never got a chance to really get under the clouds and provide the spectacular color and glow I was hoping for. Instead when I arrived (just before sunset) the river was covered in patches of fog and mist and the water level was a lot higher than I had expected at this time of year (the rocks at Fisherman's Eddy were under water). I didn't get the conditions I had hoped for, but I liked the conditions I got even better. Just enough light was leaking through the light spaces in the clouds to provide some color and contrast. The fog and mist hanging over the raging current added drama and interest. It wasn't a long photo trip, but it was well worth the investment in possibly wasted time and energy. Once again I learned the lesson that taking a chance on the risky light or conditions can pay off big time. Maybe 90% of the time you get shut out, but the other 10% provides conditions that makes those failures well worth the effort. Once again, the image above is a composite of 5 vertical images overlapped and stitched together in Photoshop CS6, for a huge file capable of big enlargements. See my post "Going Big" for more details on the technique. Great results. I can't tell you how much I would love to be able to photograph water! I will be renting a wide angle to take to New England in July for some pics in Rachael Carson. Again really nice work. Pretty picture and great accompanying story. Thanks! I would be thrilled to have this image in my portfolio Elijah, it is gorgeous and moody! Thanks all! @Ray I'm jealous, I'd love to get back to Rachel Carson. I took an image there that I loved at the time, but I'd love to go back and try to replicate/improve on it, now that I know so much more about light, composition, and technique.